http://www.ccbill.com, http://www.chronopay.com). 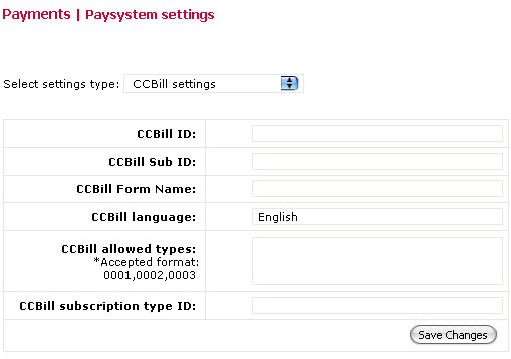 The settings for these payment systems differ, after registration on their sites you will get different details to be able to charge your users with help of them. Here are the settings tables you need to fill in for every payment solution. You can activate all of them or just one necessary payment solution. The users will be able to chose payment option available at the site and you will get their payments to the payment solution account. In this section you can also set up currency for the prices to be displayed in US Dollars, Euro or GB Pounds. All the payments will be available in the section “Payments list”, there will be a Course name, Student’s name, his email and registration date. You can change the status for this payment “Received” or not.